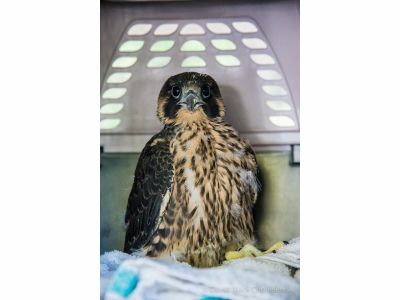 Checker, the young male Peregrine who had fallen into the parapet has had another mishap. He was spotted on the roof of the Radisson and did not appear to be able to fly. Indeed, his left wing was drooping at the shoulder and he was not able to lift it normally. Luckily he was on a section of roof that was fairly confined, which offered an advantage to his human rescuer and he was rescued relatively easily. We brought him to Braveheart Raptor Rehabilitation Center in Twin Lake and he was radiographed the following day. He fortunately does not have any wing fractures but does have a fractured coracoid bone without much displacement. The coracoid bone is part of the shoulder girdle and is the same type of injury as one of the youngsters (Birdick) had last year. His wing will be in a wrap to hold it against his body for several weeks to allow support, stabilization, and healing of the shoulder area. This is similar to having your arm in a sling but probably less fun for a bird. Hopefully he will heal and be able to fly, as Birdick was able to, but he will be in rehab for a while before we know. The process of being injured, separated from his family, captured, transported, radiographed, and kept in a confined cage while wrapped in a bandage has been stressful. So, keep him in your thoughts and your fingers crossed that he does well and can come back to join his family. I want to thank the staff at the Radisson for alerting us when they spotted a bird on the roof who was not moving or acting normally. Without getting him into rehab, a flightless bird would not survive very long on a roof.